Investigators who went to search a mobile home in connection with an armed bank robbery made a shocking discovery Tuesday. 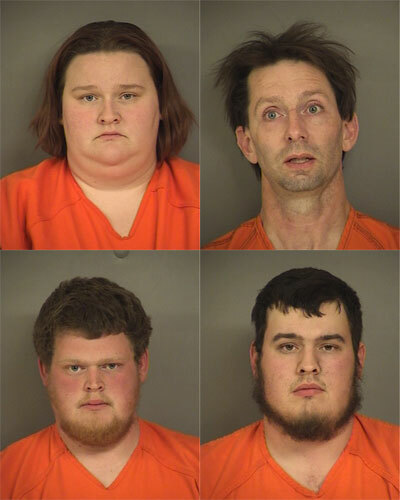 Four people were arrested on Monday in connection with the bank robbery in the eastern Iowa town of Martelle. Jones County Sheriff Greg Graver spoke with KCRG-TV on Tuesday as deputies — covered from head to toe in protective suits — entered a mobile home in Mechanicsville. “The reason that we’re in the suits is that the living conditions due to about 30 animals in the place was absolutely horrific,” Graver said. The animals included 10 dogs, 12 cats, 2 turtles, 2 guinea pigs, and several birds and fish. They’re now being cared for at an animal shelter in Tipton. Three of the suspects in the bank robbery lived in the mobile home. Graver said they’ve recovered the guns believed to have been used in the robbery and money stolen from the bank. “We have not had time at this point to count the money to verify the total amount that was lost,” Graver told KCRG on Tuesday. Shortly after the bank robbery on Monday, authorities arrested 24-year-old Andrew Palmer of Mechanicsville and 22-year-old Shiloh Palmer of Mt. Vernon. The two men are brothers and both are charged with first-degree robbery. Their sister, 25-year-old Elizabeth Olinger, and her husband, 41-year-old Peter Olinger are accused of aiding and abetting the robbery by driving the two getaway cars.